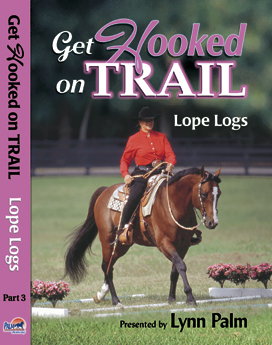 Lope logs are the most difficult of all the log obstacles that you will find on a Trail course because you have to control your horse’s balance, speed and direction before, over and after the obstacle. Controlling your horse’s lope takes time and patience to perfect. Lynn will give you the tools to do this! Lynn will share many training tips to improve your horse’s responses. She will show you how to do several combinations perfectly with the same rhythmic, balanced steps. Lynn will also show you how to correct common problems that arise when doing lope logs. Since the lope logs present more degree of difficulty then other obstacles, they could earn higher scores. Lynn will give you the best tips to avoid any “ticks” over the poles and to get a balanced take off distance. You will be rewarded with the best scores that will take you to the top of the class. If you are looking for fun and challenging training using poles at the lope, you will love Lynn’s simple and achievable methods. Your horse will love the step by step training that will give him confidence. With this confidence, you horse will compete with a beautiful relaxed expression when doing this obstacle. This training adds variety to your daily training and your horses will try harder because they love a stress free challenge! PPT - Training Course Part 1Reg. Price $29.95 $25.46 On Sale!